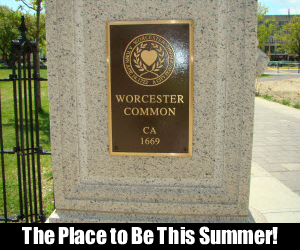 The Worcester Common is the location of many great Worcester traditions. The Worcester Common Concert Series otherwise know as the “Out to Lunch” series started up again today. The series has been going on the last couple of years and is so popular that it has been extended to 10 Fridays. They take place from 12 noon to 2pm each Friday of the summer. I have copied the remaining schedule here for your convenience but more information can be found on the City of Worcester announcement page for concerts. July 8: Grupo Fantasia. Latin/Caribbean sounds. July 15: The Diamond Collection. Neil Diamond tribute. July 22: Decades by DeZyne. The sounds of Motown. July 29: Dale LePage and the Bobby Gadoury Trio. Classic American standards and more. Aug. 5: Sun Parade. Indie rock and folk. Aug. 12: Dell Smart and Exit In. An eight piece band performing reggae, punta and Caribbean..
Aug. 26: The Reprobate Blues Band performing R&B. Sept. 2: The Drunken Uncles. Acoustic pop, blues, folk and classic rock. If movies are more your thing the Worcester Film Works will be putting on few Movies on the Common courtesy of Hanover Insurance. The movies are on specific Thursdays and unfortunately the airing of Grease happened last night. You will be able to catch Back to the Future and Spaceballs later this summer though on July 28th and August 25th respectively. More details can be found on the Worcester Film Works website. Please note, if fireworks are your thing the Mass Symphony Orchestra is having their fireworks concert tonight!